"Protesters" from the several Bulgarian mountain towns have gathered in the capital Sofia to stage a rally in support of the country's controversial Forestry Act that was vetoed on Saturday. 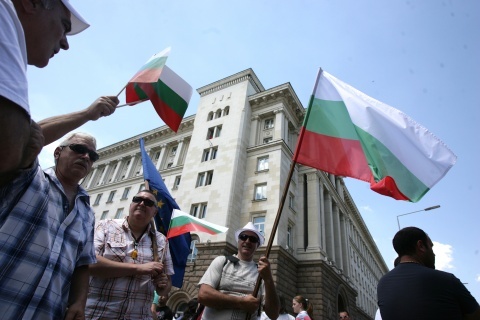 The rally is widely believed to be instigated by Bulgaria's ruling centrist-right GERB. The "protesters" are from the towns of Samokov, Smolyan, Berkovitsa, Dupnitsa and Bansko. Even though Wednesday is a working day, they have been organized and transported to the capital's downtown by their respective municipal authorities. The rally is being guarded by police, dnevnik.bg informs. The rally aims to express opposition to the series of protests held last week in Sofia against the newly adopted (and newly vetoed) facilitated regime for construction of ski lifts and ski runs without changing the status of the land. Thousands of Bulgarian nature lovers and other citizens opposing the Forestry Act have been staging protest rallies in the area of the key intersection of Orlov Most (Eagles Bridge) in Sofia ever since Wednesday evening. As a result, President Rosen Plevneliev vetoed the controversial piece of legislation.